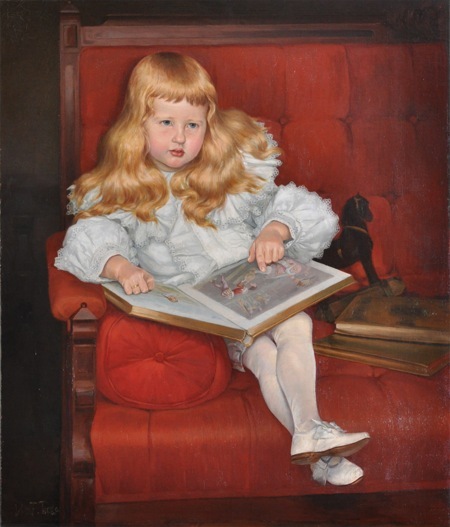 The child is seated in a large red chair holding an open book. He points to an illustration for the nursery rhyme Old King Cole. Luther Dowlin paid the artist $100 for this portrait of his youngest child, according to a receipt still owned by one of Dowlins descendants. An oil study for this work survives as well. Received from the artist by Luther Dowlin of North Wales, Pennsylvania, who commissioned this portrait of his son. It passed to Dowlins granddaughter, Marie Inslee. During a move, it was lost by a moving and storage company, but later inexplicably turned up, damaged, at Weschlers Auction Gallery in Washington D.C. Weschlers sold it in 1987 to Ralph Marker fo Virgina. His wife, Mariska Marker, eventually sold the painting. It surfaced once again in Weschler's Auction Gallery in 2012 and was purchased by Jonathan Chatellier. In 2016, the painting was offered by Rago Arts and Auction Center in Lambertville, New Jersey. It was purchased by a descendant of Luther Dowlin, who had originally commissioned the painting in 1897. The painting was said to have been damaged when it came to Weschlers Auction Gallery and was conserved for purposes of the sale in 1987. It was restored again in 2012 by the McClees Galleries in Haverford, Pennsylvania, and is now is excellent condition and in its original frame.